Wasabi is an interesting ingredient and one that is not normally associated with cocktails. It is, however, an alternative way to get a spicy drink without using hot pepper ingredients. In the cucumber wasabi martini, the Japanese horseradish is paired with gin and cooled down with fresh cucumber to create a very lively and intriguing cocktail. Typically, wasabi martinis are vodka-based. Switching to gin gives the cocktail more dimension and the array of botanicals plays nicely against the pungent paste. Admittedly, this may not be the drink for everyone, but if you're an adventurous drinker, try it. It may just become a new favorite! In a cocktail shaker, muddle the cucumber slices, wasabi, and simple syrup. Fill with ice and add the gin and juice. Using a softer gin like Hendrick's leaves you with a nice balance of sweet, sour, and spice and that brand happens to have a cucumber profile, so it's perfect here. The typical juniper-forward gins (like the London dry style) may be a little too much for some tastes, but they're definitely worth a try in this recipe. The level of heat your drink will have is going to depend on how much wasabi you use. Start with a smaller amount at first because it is very easy to burn the drink. If you want it a little hotter, go with a little more paste in the next round. Remember, balancing flavors is key to a great cocktail. Fine straining the cocktail means to pour it through a fine mesh strainer while using your regular cocktail strainer. For drinks like this, it's crucial because it will help filter out bits of wasabi and cucumber, especially the seeds. The average slicer cucumber will work here, but you might want to consider using English cucumber for cocktails. This variety tends to be less bitter and the seeds are so small that, if they make it into the glass, they won't be an issue. If you like, pour vodka instead of gin. You can even try a cucumber vodka to really play up that flavor. Sake is another great option for the base, particularly if you're going to pair the martini with Japanese cuisine for dinner. How Strong Is a Cucumber Wasabi Martini? 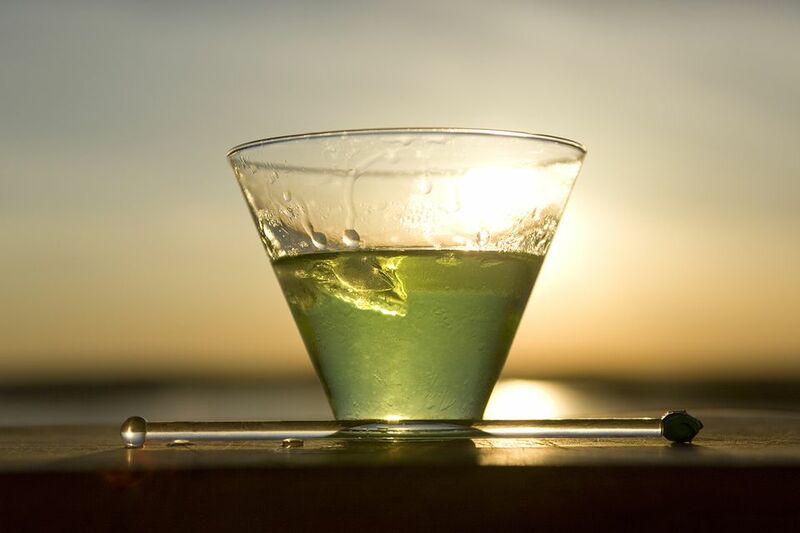 The cucumber wasabi martini is packed with flavor but relatively light on the alcohol due to the fact that gin is the only liquor in the recipe. If you pour the average 80-proof gin, this drink shakes up to just 20 percent ABV (40 proof). While it's certainly not the lightest cocktail, it is on the lower end of martinis.